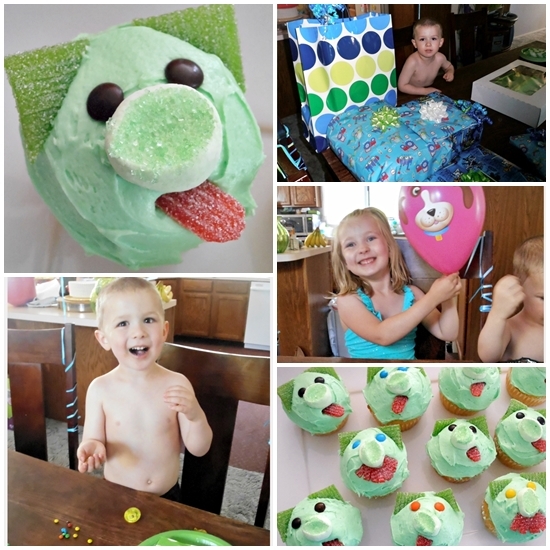 My son Jack turned 4 last weekend and we celebrated with a themed birthday party of his current favorite - Angry Birds. 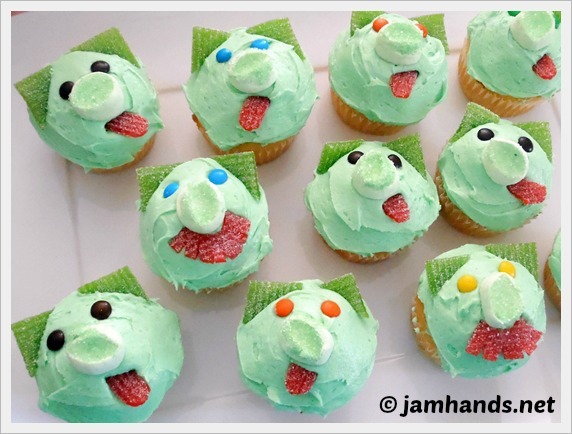 How about those angry piggy cupcakes? I thought they turned out really cute. The tongues sticking out were a spur of the moment addition, along with a few mustaches. I had planned to do more for the party but as I mentioned, I have been very sick lately so I just didn't have the energy to do more. We were outside for most of the party and set up a kiddie pool, sprinklers and a radio. (Who picked the country station for music??) We grilled cheeseburgers and hot dogs, along with the Best Ever Broccoli Salad, a traditional potato salad with diced sweet pickles, punch, chips with homemade chip dip (Penzey's Chip Dip is awesome! 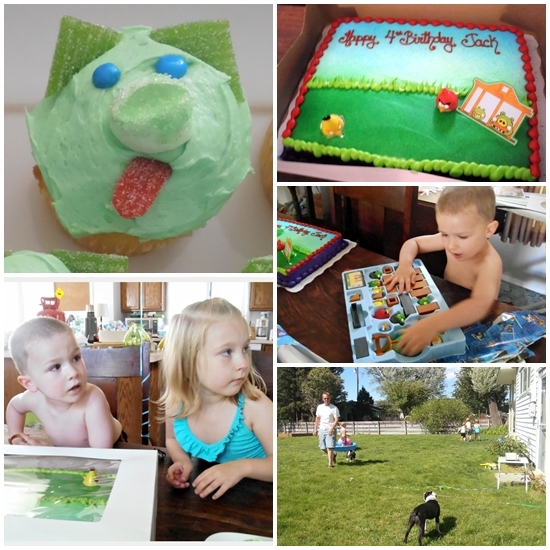 ), Piggy cupcakes and we got a angry bird sheet cake from a local grocery store. 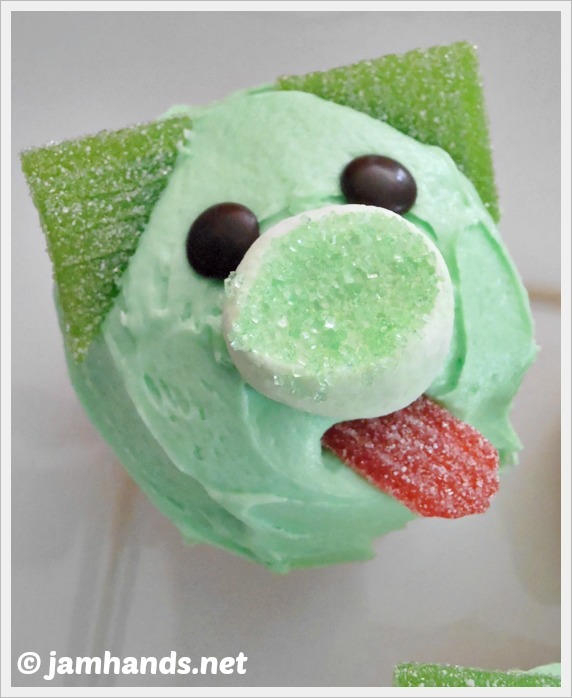 The Angry Piggy Cupcakes were made with a yellow cake mix, a homemade frosting tinted green, lime marshmallows cut in half and dipped in green sanding sugar, mini M&Ms for the eyes, and for the ears, tongues and mustaches we bought a pack of gummy sour candies that come in rectangle strips and we cut them to the appropriate shapes. The wind was pretty crazy and popped all of the balloons outside, blew away the plates and napkins and blew a bunch of grilling smoke in our faces, but even with all of that it was a nice time. The kids enjoyed the warm weather, which we haven't had much of yet, mainly just rain and more rain. Leading up the party my son had been pretty adamant in saying that he was NOT turning 4, but instead was gonna stay 3 years old instead. By the time the party finally came around he finally had accepted that he was turning 4. It was a fun and low key party for a little angry bird loving kid. Happy 4th Birthday to my little man!